One month after a firestorm swept across Apple community when a conspiracy theory that Apple had been throttling its older iPhone was confirmed, moments ago Bloomberg reported that the DOJ and the SEC have launched a probe whether Apple violated securities laws concerning its disclosures about a software update that slowed older iPhone models. According to the report, the government has requested information from the company, although the inquiry is said to be in its early stages, and it’s too soon to conclude any enforcement will follow. The probe comes several weeks after Apple admitted to slowing down the performance of older iPhones models as a way to make their internal batteries last longer. Apple released a software update early in 2017 to start throttling older iPhones, but didn’t specify that the action slowed the devices. In December, Apple apologized for not communicating this information and vowed to release another update to mitigate the concern. In response, Apple plans to release an iPhone software update, called iOS 11.3, in the spring with new features that allow users to monitor the health of their batteries and protect against slowdowns, although an earlier report from Axios today suggested that the OS update may be delayed. Apple has claimed that if consumers turn off the throttling, older iPhones will be more prone to randomly rebooting. As Bloomberg concludes, the situation is a self-inflicted black eye on the company, based in Cupertino, California. The company has been wrestling with some other software-related issues, including processor vulnerabilities that have affected other technology companies and a login flaw that allows intruders to access files on Mac computers without a passcode. Axios reported that Apple is delaying some key iPhone and Mac software features planned for release this year to focus on quality improvements. 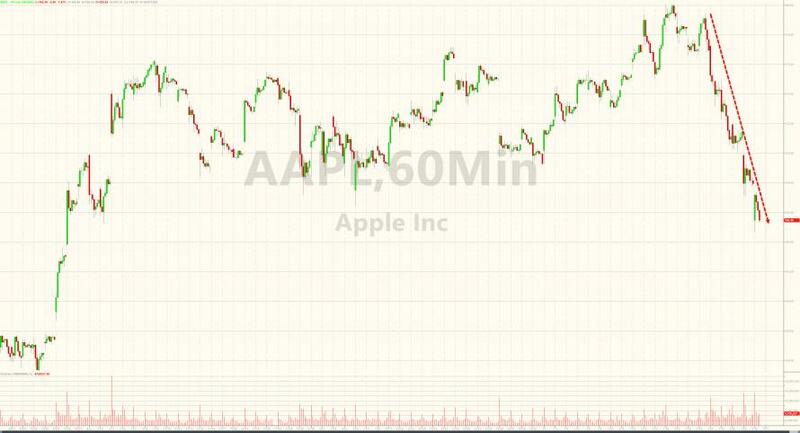 The news, which follows an earlier update from Deutsche Bank concluding that the iPhone X is too expensive to begin a new Apple supercycle, pushes AAPL stock to new session lows just one day ahead of its earnings report after the close tomorrow.